We are proud to be the first company to have been awarded with the seal "continuously audited" by the DLG! Read the full DLG test report here! Available from now on: the new BELMONDO Style for some colour in the stable! Already introduced at the Equitana 2017, it is available as standard from now on: the new BELMONDO® Style! The four naturally marbled colours maroon, basalt, forest and tundra give every stable an exclusive touch. It has a surface structure with an appealing checked design, the proven benefits of BELMONDO® mats shine with a modern design: quietness, sure-footedness and easy cleaning. 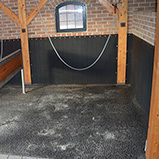 Ilka B. equipped the preferred lying area in her open stable for cold-blooded horses with BELMONDO® Trend. 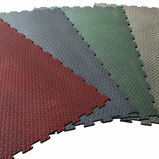 She decided on rubber mats because the joints of both horses were chafed. In the newly built stable the washing areas, boxes, paddocks and the solarium are equipped with BELMONDO mats. 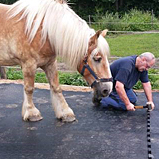 In a short inverview Franjo Koletic, owner of the stable, and his daughter Josipa report about their experiences with the rubber floorings.